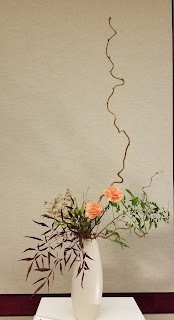 A tokonoma in a private home featuring an Ikebana arrangement. 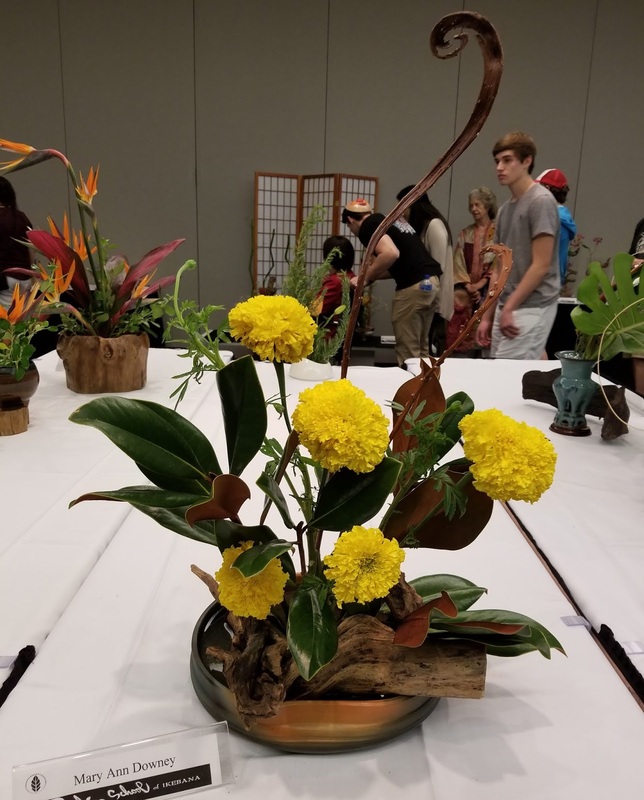 Japan Fest 2018 in Atlanta was an outstanding success, attended by more than 20,000 people, although judging from my experience on Sunday, there seemed to be many more! There were dozens of vendors selling everything from Anime-related objects, packaged Japanese food, toys of all kinds for children of all ages, and - of course - Japanese kimonos, haori, obi and jackets. 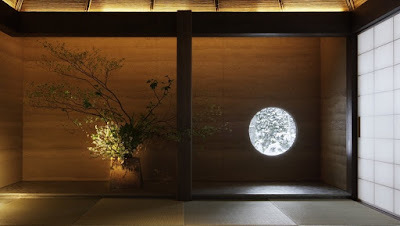 I bought two haori, both in a heavy cotton which will be comfortable through Fall. 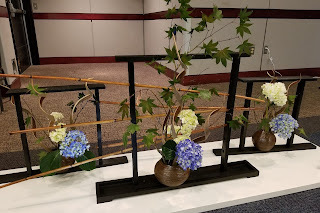 My next stop was the Ichiyo Ikebana Atlanta exhibit where the arrangements were outstanding. 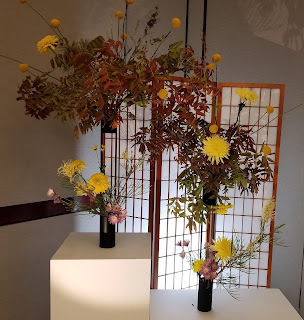 This marvelous Ikenobo arrangement greeted visitors as they entered the exhibit room. 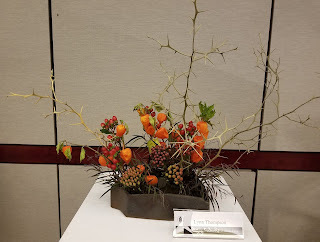 The arrangement above was created by twelve-year old Veeraj Chaudhry. He has skillfully blended white mums and lavender heather with Bells of Ireland. 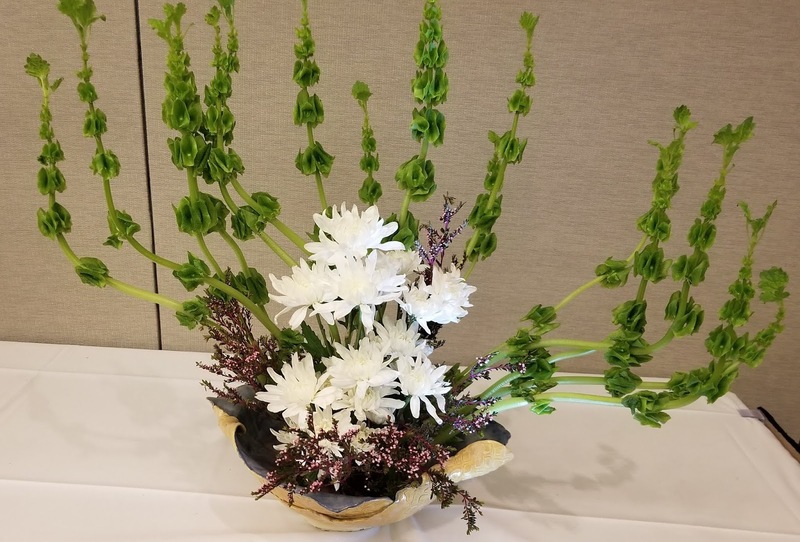 This lovely arrangement was made by Mrs. Chaudhry, Veeraj's mother. 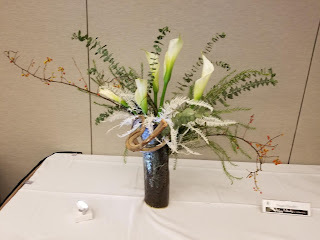 She combined Eucalyptus, Bittersweet branches and feathery ferns with white Calla Lilies. 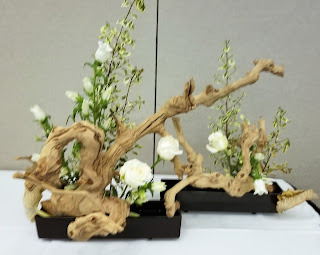 The addition of the twisted wood branch adds another dimension. 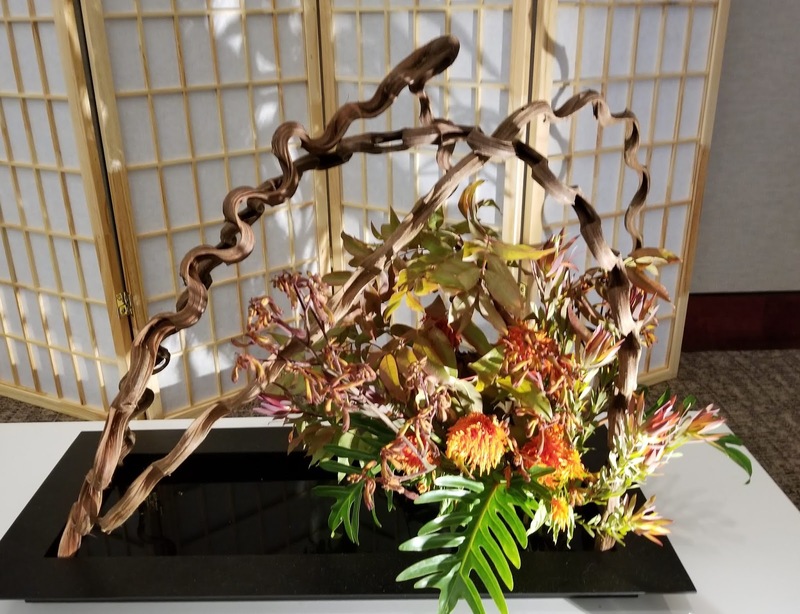 Another creative design by Emi Zoblotsky who used ferns, twisted wood branches and Protea, along with fading Kangeroo Paws. 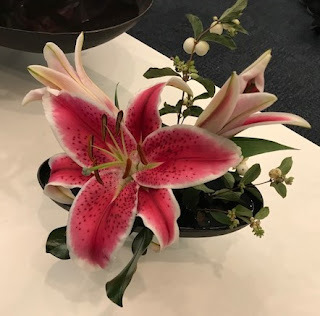 I found this double arrangement by Shirley Kendrick fascinating. Here the flowers are secondary to the wood branches that arch, twist and seem to reach for the sky. The delicacy of the white roses contrasts beautifully with the strength of the wood. Karen Fishman has chosen to create a beautifully simple arrangement using only three elements: greens, roses and a spiraling twig. However, while appearing simple, the design achieves both grace and movement. 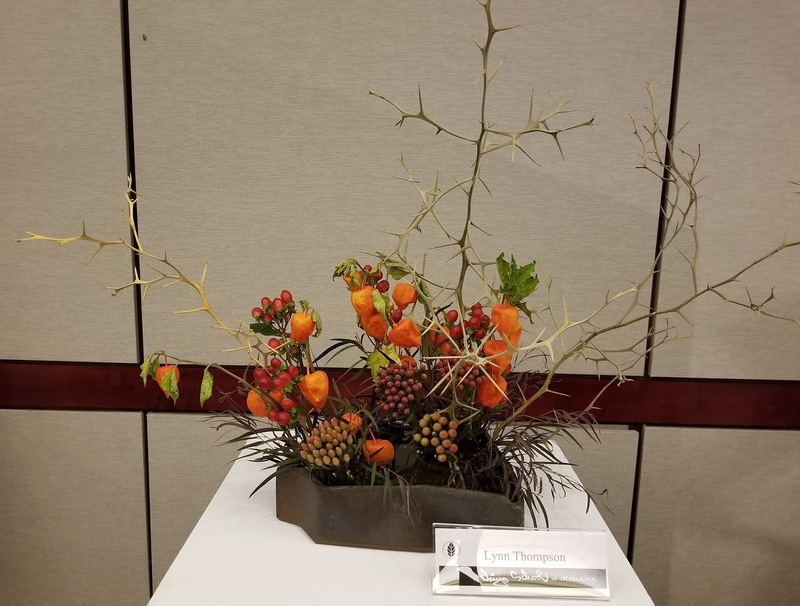 I loved this arrangement by Lynn Thompson who used spikey twigs, seed heads and delightful Chinese Lantern flowers that resemble paper lanterns. 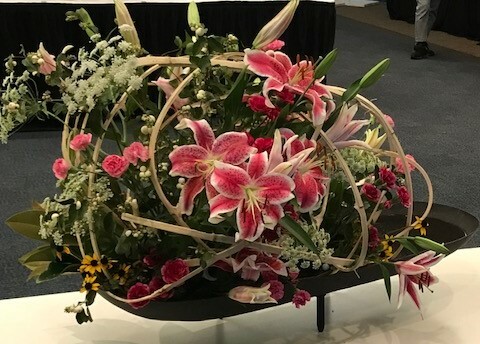 This arrangement by Mary Ann Downey uses yellow marigolds, red-striped leaves and a fiddle-head fern to great success. Note how the piece of wood at the base anchors the arrangement. This spectacular assemblage was created by Executive Master Elaine Jo, the force behind the Ichiyo Ikebana Atlanta school. Elaine used fall foliage, yellow mums, grasses and small purple flowers to great success. The narrow, stacked containers are quite extraordinary. 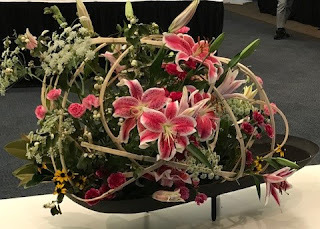 It is unfortunate that I was unable to fully capture the size and drama of this triple complex arrangement by Linda Suskin. 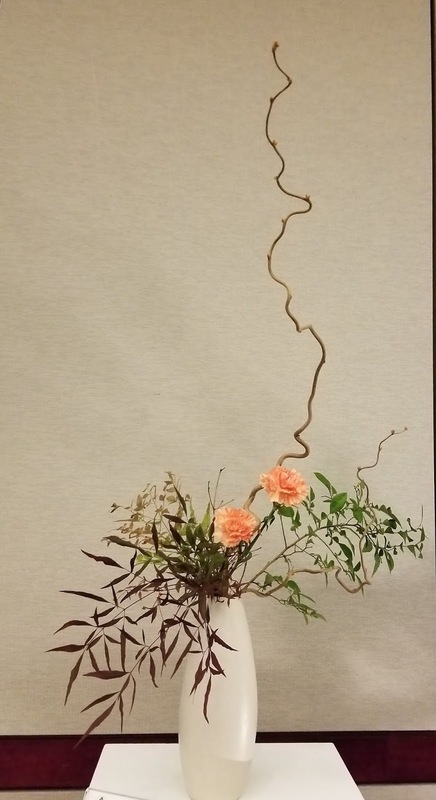 It is a fine example of an Ikebana arrangement that would be presented in a hotel or corporate lobby. Here we have another complex arrangement that might be presented in a corporate environment or a tokonoma in a Japanese home. 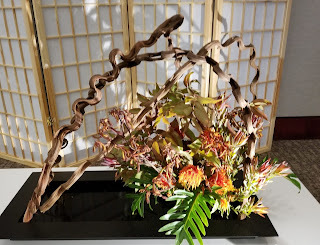 Sheila Proffitt has used wood, Protea, Magnolia leaves, delicate Babies Breath and stalks of green, bent bamboo to great effect. Jo Tu has blended white roses, Birds of Paradise and tiny purple flowers with a large Monstera leaf, weaving a strand of vine throughout the arrangement, a nice touch, indeed. 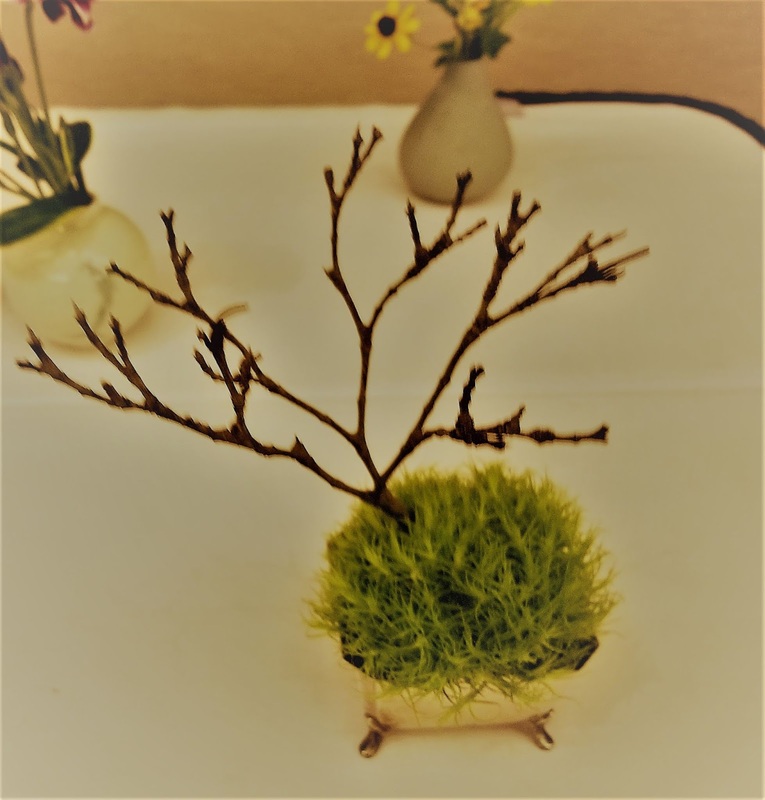 And finally, an arrangement that skillfully illustrates the beauty to be found in small examples of nature that often escape our notice...a simple mound of moss and a tiny twig. This exquisite arrangement was on a front table as one entered the exhibit area. The woven kaun (cloud) is made of hand-cut strips of bamboo. 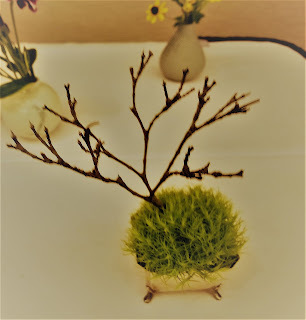 This lovely arrangement, though small in size, acted as a perfect companion to the larger Ikebana example above. There were several more beautiful examples that I was unable to capture well due to either objects and/or people in the background. In closing, I hope the many examples of Ichiyo Ikebana shown here will encourage others to look into classes given by the school in Atlanta. 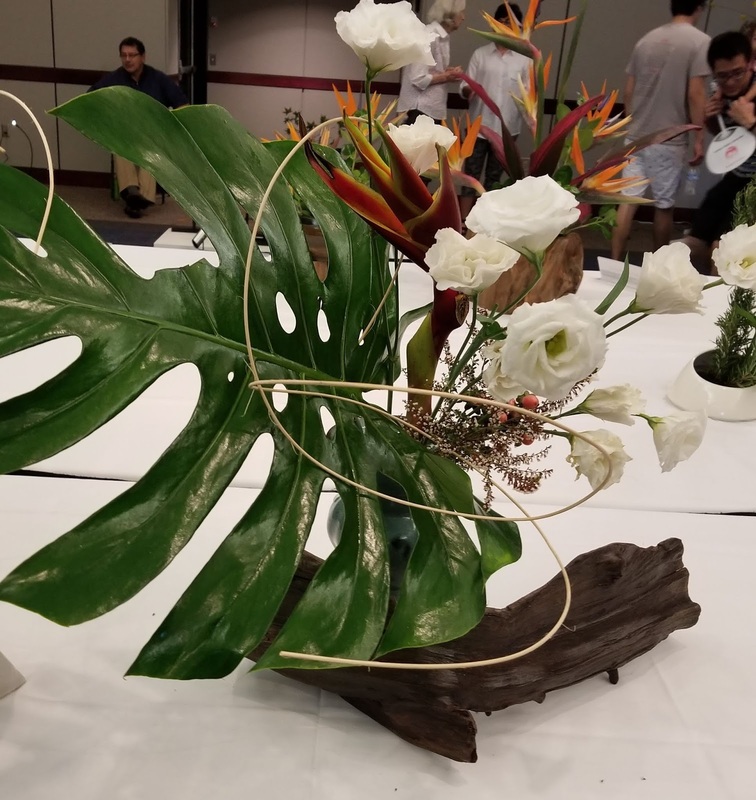 With the exception of Master Elaine Jo's arrangements, all the designs shown here are by students, which I found to be very encouraging. For more about the school, click the link on the top right of the page. To enlarge pictures, click in the center. 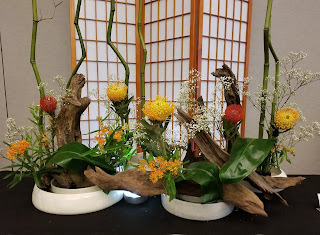 Ichiyo Ikebana School, Atlanta, Geogia. I was born in Manhattan and grew up in its environs. Since New York City is one of the style capitals of the world, naturally I loved fashion and design. I first fell in love with Japanese design when I discovered Takashimaya, the wonderful department store, alas now closed.